CLEVELAND - Corey Kluber's teammates knew it was only a matter of time before he returned to his Cy Young form. Kluber allowed one run in eight innings and the Cleveland Indians won their fifth straight game with a 2-1 victory over the Cincinnati Reds on Saturday. Kluber, the top pitcher in the American League last season, was 0-5 after seven starts, but has turned in three strong starts in a row and is now 2-5. "You don't dominate the entire league the way he did last year without being able to have some good starts coming up the next year," said second baseman Jason Kipnis, whose RBI double in the eighth put Cleveland ahead. "The guy's stuff is fantastic," Kipnis added. "He does all the little things. The guy knows how to pitch, too." The Reds lost their season-high seventh in a row, but manager Bryan Price wasn't around to see it. He was ejected by umpire Jim Reynolds after the exchange of lineup cards. They got into a lengthy argument that carried on as the Indians took the field. The dispute stemmed from Friday night, when several Reds were upset with plate umpire Manny Gonzalez's strike zone. "It was just a hangover from yesterday, that's all," Price said. Manager Terry Francona didn't send Kluber out for the ninth because the pitcher felt a slight twinge in his right hamstring. Cody Allen recorded his ninth save. "It's fine," Kluber said of his hamstring. "On a couple of pitches in my last inning, it grabbed a little bit, so I think he was just playing it safe." Kluber recorded 30 strikeouts in his previous two outings, but had to work around constant trouble. He allowed nine hits, struck out seven and didn't walk a batter. Cincinnati had at least one hit in each of the first seven innings. "The Kluber we've been seeing, I thought he dialed it in and got it going as the game went on," Francona said. Kluber struck out 18 and allowed one hit against St. Louis when he recorded his first win of the season on May 13. He followed that by holding the White Sox to one run in nine innings while striking out 12 in a no-decision. "Each start is its own," Kluber said. "What I did the last time here didn't affect what I did in Chicago. It carries on that way. Whether the last one was good or bad, it doesn't really affect the current one." Tony Cingrani (0-1) walked Roberto Perez to start the eighth. Following a force play, Kipnis lined a double to left-centre that scored Michael Bourn with the go-ahead run. Reds rookie right-hander Anthony DeSclafani evenly matched up with Kluber and allowed one run in seven innings. Zack Cozart's sacrifice fly in the second gave Cincinnati the lead. 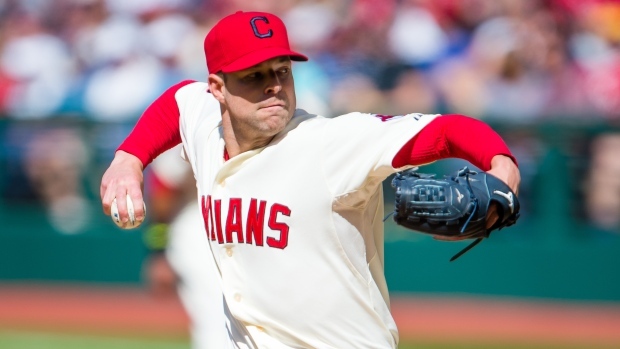 DeSclafani held the Indians scoreless until the sixth when David Murphy's RBI single tied it. Indians OF Michael Brantley, who has been dealing with a sore back since spring training, didn't play. He has hit safely in 18 of his last 21 games and is batting .319 for the season. Reds: C Devin Mesoraco (left hip impingement) will be re-examined Monday when the team returns to Cincinnati. An All-Star a year ago, he experienced increased pain in the joint after working out Friday in Cleveland. Indians: Catcher Yan Gomes (sprained right knee) is scheduled to be activated Sunday. He was injured April 11. Gomes caught nine innings Friday at Triple-A Columbus in his last game on a rehab assignment. Reds: RHP Raisel Iglesias, a rookie from Cuba, will make his third major league start. RHP Johnny Cueto was scheduled to pitch, but was scratched after experiencing mild stiffness in his right elbow. Indians: RHP Trevor Bauer, who is 1-1 with a 5.34 ERA at home this season, seeks his first career victory over Cincinnati. He pitched a season-high 7 1/3 innings in beating the White Sox on May 19.